​Children ages 6-9 have a keen sense of justice. The Elementary Montessori program includes peace education, conflict resolution and community building as part of the curriculum. Children learn to address concerns directly with classmates in the Peace Corner or raise unresolved issues with the class during weekly community meetings. Leadership and citizenship skills are developed as each child assumes responsibility for leading the morning meeting each day and the community meeting on Friday where issues concerning the whole class are discussed and solutions agreed upon by the students themselves. The children at Medina Montessori serve as hosts for guests who visit the class and at all Open Houses. They are responsible for maintaining the class environment, providing snack and for the care of class plants, pets, composting and organic garden. 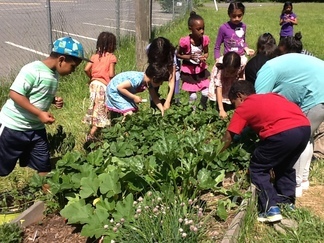 ​At Medina Montessori, children are passionate about the environment! Children are keenly aware of the need to protect and preserve the environment and are outraged by the use of chemical pesticides and artificial fertilizers on our plants. They understand their impact on our water, soil and food sources. As a Zero Trash classroom, all plastic is recycled. Paper and food scraps are composted. They are learning sustainable living practices and raised money to purchase a rain barrel to collect water and a worm composting bin to convert our food scraps and recycled paper into rich soil for their garden. Children have learned that the widespread use of genetically modified seeds has caused long lasting damage to the Earth's soil and are learning more sustainable methods of growing food that is also more nutritious! Insha'Allah, the children will collect seeds this Fall to re-plant in the Spring. For one week during the summer each child assumes responsibility for caring for and harvesting the vegetables and herbs in their garden. An essential element of the Elementary Montessori Program is learning that takes place outside the classroom. During the 6-9 year period the child's horizons are expanding and opening up to a virtually limitless quest into the world outside herself. Children in the second plane of development are no longer content to remain inside their homes and schools.They need field trips and excursions to give them experience of the world outside their own limited surroundings. The DC metro area is blessed with countless resources. 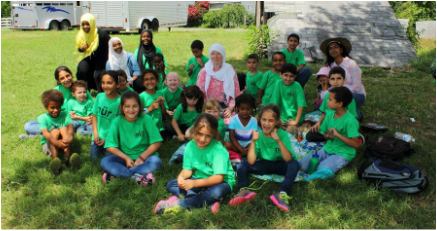 Medina Montessori children are out exploring their community every Friday touring local museums, recycling centers, organic farms, attending workshops at local nature centers and visiting theaters, libraries and parks, to name a few. The classroom is prepared in such a way as to allow each child to explore, learn, study, and grow according to the natural plan developing his or her unique gifts, fostering creativity and promoting self-discipline and independence.